Here’s one the first lessons of living in China: Nothing is ever spelled consistently. For instance, Qingdao, a town on China’s eastern coast, about midway between Beijing and Shanghai, is the very same as the formerly spelled Tsingtao, pronounced “Chingdow” (with the the “d” giving a slight “t” sound). It is this same venerable town that was settled by the Germans in the late 1800s — hence the brewery — and hosts China’s largest beer festival every August. 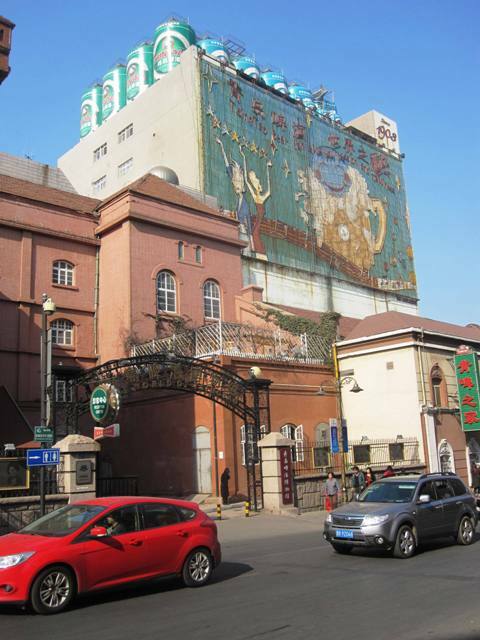 While the Tsingtao beer brand has been going strong since 1903, it has also undergone many a transformation, both in ownership as well as bottling and taste. For example, when the Germans first brewed the stuff back in the day, they made a pilsner (a light colored beer) and a dark Munich-style lager, bottling both in brown bottles. The beer was so good that it won a gold metal in the 1906 Munich International Exposition! 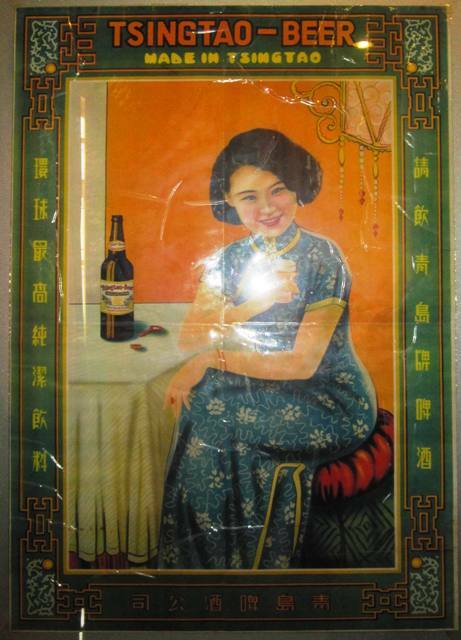 Subsequently (in 1916), the Tsingtao brewery fell under Japanese ownership until the Chinese reclaimed it in the 1940’s. Around that time, the beer bottles also changed from brown to green, thus significantly altering the taste as green bottles (and clear as well) create the “skunky” taste (such as the familiar flavor found in Heineken’s green-bottle beer) if the hops are not pre-treated to resist the natural photoxidation that occurs when the hops are exposed to light. Brown and amber bottles, as well as cans, block the light waves that create photoxidation in beer, which is why beers in darker bottles (and cans) do not have that same skunky flavor. 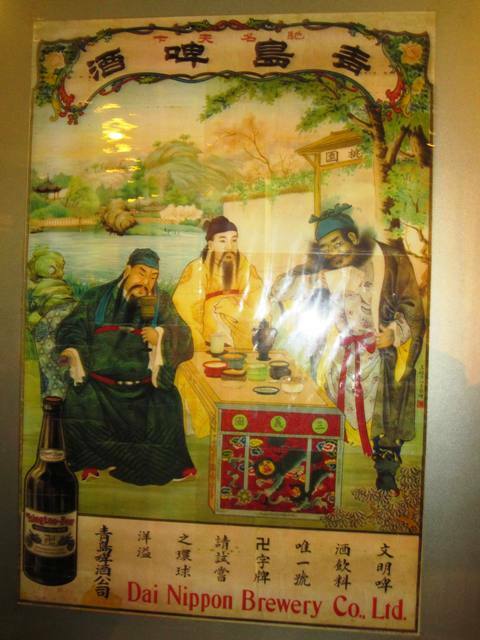 All that to say, Tsingtao’s famous skunky, Heineken-like flavor is, in fact, not the way the beer was originally crafted! 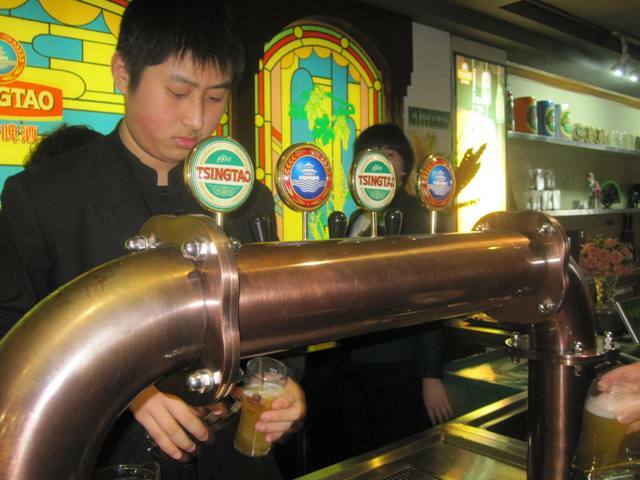 A tour of the Tsingtao brewery in Qingdao (50 RMB per person — around 9 USD) offers interesting insights into the brewery’s history, product and manufacturing displays as well as a free tasting of Tsingtao’s famous pilsner and a delicious unfiltered version. The unfiltered version is amazing — it tastes similar to a Sam Adams with that flowery, hoppy flavor really coming through. And because both versions were served from a keg instead of a green bottle, happily, no skunkiness lurks in those waters. 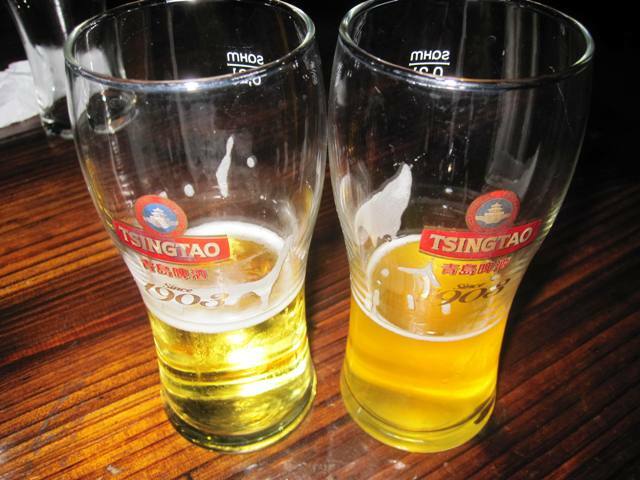 Unhappily, we have yet to locate the unfiltered version of Tsingtao beer anywhere else. There is a green-bottled “Augenta” variety of Tsingtao which is touted as a premium pilsner, but even it does not capture the aromatic flavor found in the cloudy, unfiltered version. At any rate, Qingdao’s got a lot going for it besides beer. 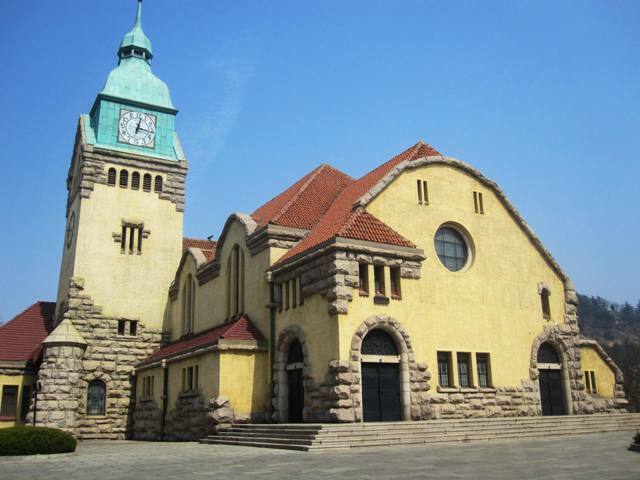 Touted as one of the “greenest” cities in China, its largely intact, 19th century German architecture (complete with cobblestone streets), its hillsides-meet-the-sea setting and its proximity to the famous Mount Laoshan (the mountain where unified China’s first emperor climbed in search of eternal life) are just some of its draw. 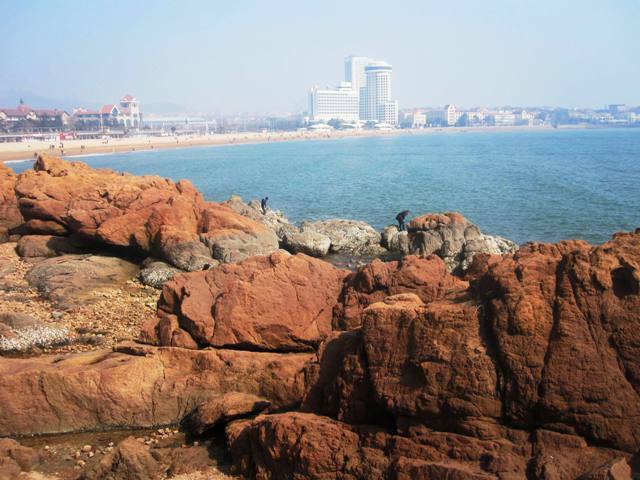 The beaches on the east side of Qingdao, especially those found within Luxun Park, are unexpectedly striking with their terracotta-colored cliffs and clear, blue water. 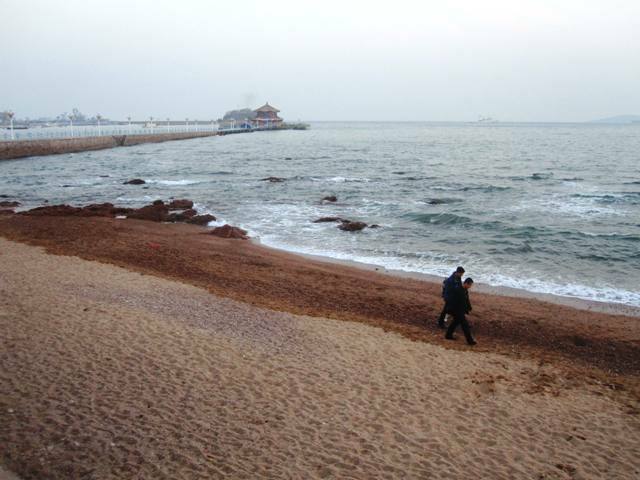 While the beach along central downtown Qingdao is not as pretty, the pagoda there (featured in the third photo below) is the very same whose image is found on the famous green Tsingtao label. 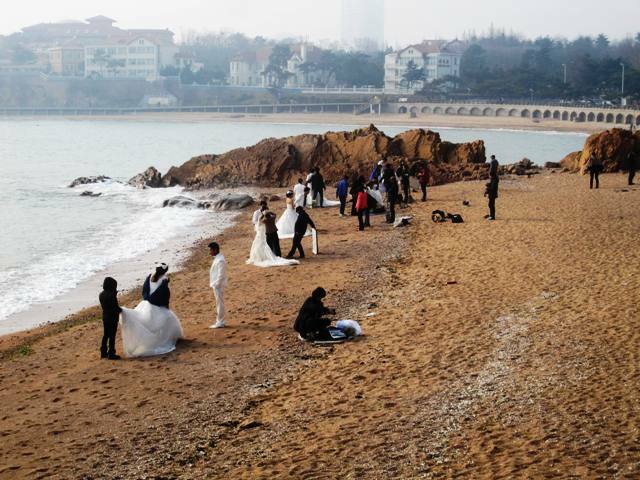 And if you are interested in the strange phenomena that is the booming wedding photography business in China, then take a stroll along Qingdao beach on eastern side (outside of Luxun Park boundaries). There, a veritable conveyor belt of wedding photo shoots are everywhere– and this was just on a regular Monday afternoon! 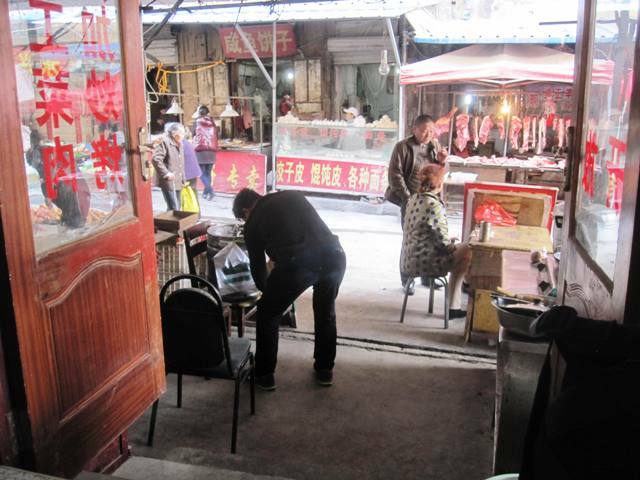 Qingdao old town is a time-traveler’s paradise. The crooked, cobblestone streets curving around super steep hills look nothing like other modern east-coast cities like Shanghai or Beijing. And the eclectic blend of German architecture meets funky, outdoor traditional markets and exotic street food is bewildering … but in a good way. 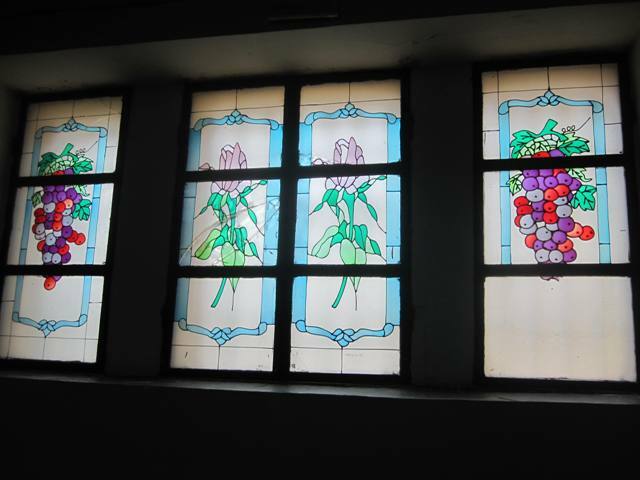 We enjoyed visiting the Qingdao Old Protestant Church that was completed in 1910, but, like most historic churches in China, the interior has been largely gutted and the once-ornate windows replaced with stick-on “stained glass” motifs. On a happier note, the Qingdao street food stalls and markets are a lot of fun to browse and photograph. 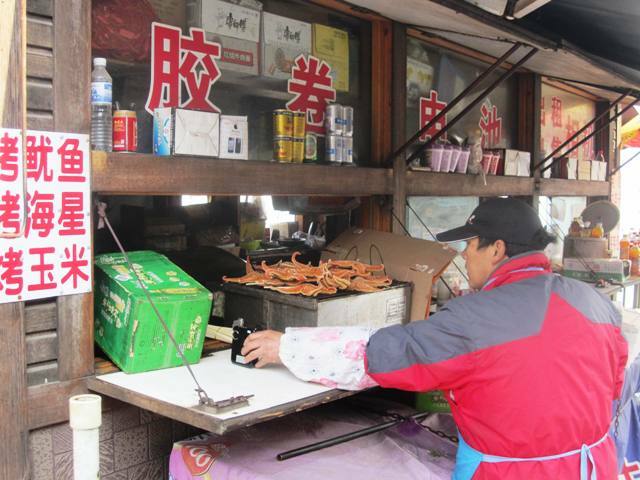 Qingdao is famous for its fresh seafood (especially mussels) but all sorts of other treats are available as well. 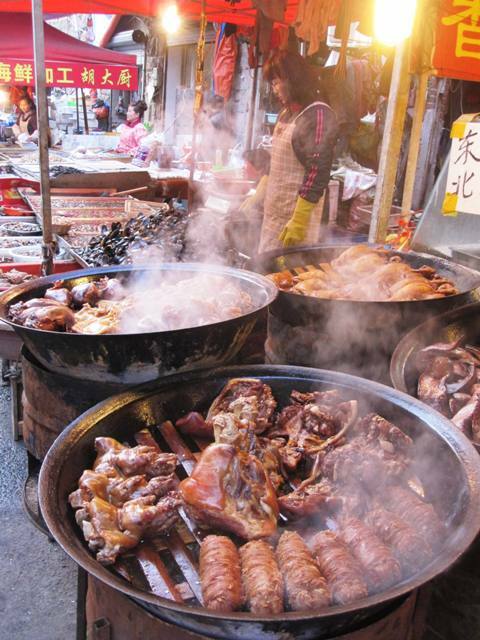 The street markets in downtown Qingdao are a great way to see what’s cookin’! You can order whatever you like and then just pull up a seat at the nearby stall-turned micro-restaurant. 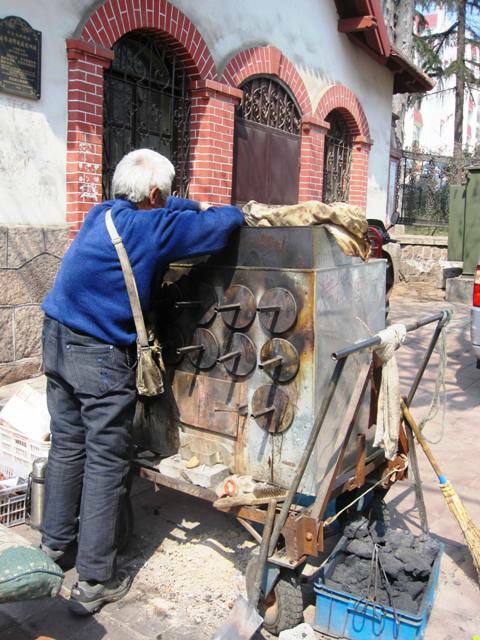 As for more easily defined street food, this enterprising contraption below is actually a sweet-potato roaster! Each round hole on the facade pulls out into a little oven-drawer where a sweet potato is placed until roasted! Also? Qingdao is the only place on the planet that I have encountered the [dubious] street-food delicacy of … starfish on a stick! But yeah. The beer is the highlight. So if you find yourself in Qingdao but don’t have time to visit the brewery, do not despair. This town is riddled with street-side shops and restaurants where kegs of Tsingtao promise respite to thirsty travelers. And if you don’t have time to sit and enjoy a pint? No problem. They’ll just pour a bag for you! 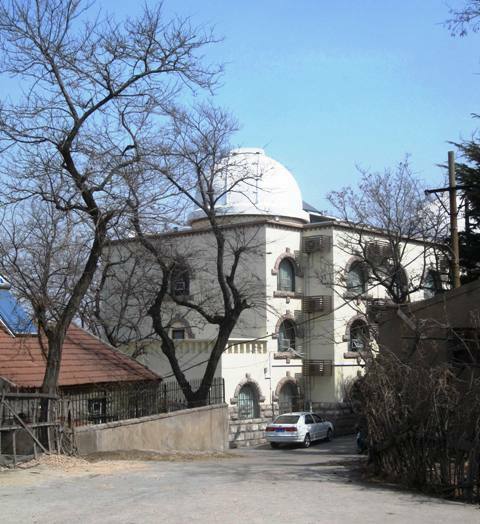 We stayed at the Old Observatory YHA Hostel, located on a hill overlooking the tile rooftops and winding, cobblestone streets of Old Town. Getting there is a bit of a hike, but the view and price make it worthwhile, especially if you need to work off that free sample from the Tsingtao Brewery! 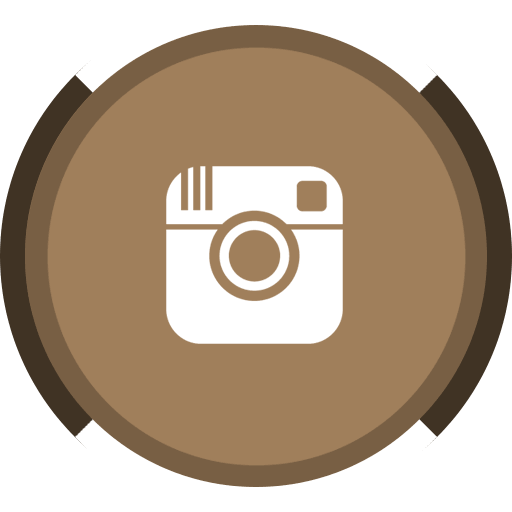 Website: http://www.hostelqingdao.com (this website was down when I tried it, but you can also find them at www.yhachina.com). This friendly, laid-back place has dorm rooms with shared facilities and private rooms with en-suite bathrooms (hot water, AC and wireless included) but the real draw is the rooftop cafe and bar. Where else can you snack on calamari made fresh from the local market and sip a Tsingtao beside a giant telescope hovering under the observatory dome? The outside deck is great, too, and a nice place to unwind at night. Also, the nightly specials are an excellent deal. For 50 RMB (around 9 USD) you’ll dine on a buffet-style dinner that changes theme every night, complete with free-flow soda drinks, tea or … you guessed it, Tsingtao!